If you have read our blog about packing you will know that we have brought a minimal number of clothes away on our trip with us and therefore washing is a chore that we can’t escape from! Here is a little insight into how we have managed so far, and we’ve included the good, the bad and the ugly of washing on the road! After spending so long in our clothes when we arrived in Thailand we really needed to do some washing straight away. The hotel offered a laundry service, but to be honest it was way too expensive – we did use it for 2 t-shirts and a shirt but it cost way more than we wanted to spend so everything else had to be hand washed. A great tip we’d had was to bring washing powder in a plastic bottle – we were slightly dubious about bringing a bottle of white powder through customs but we got through and it was perfect as we could always wash wherever we were! So in our lovely fancy hotel, we filled the bath and hand washed our underwear, swimwear and trousers before we left for Chiang Mai. After our time in Chiang Mai and the Elephant Nature Park, by the time we go to Koh Samui, we had a lot of washing again! So we enquired at the villa as to the location of the nearest laundry – to be honest, we know this as nearly every house we had driven past on our way to the villa had a ‘laundry’ sign outside of it! It seems that in Thailand, you either have self-service washing machines in your garden or a laundry sign indicating you take laundry in. Feeling a little dubious we choose a laundry that had both, as well as a fresh fruit stall and small convenience stall – we felt this was the most trustworthy for our clothing! We handed over our large bag of clothes and they were weighed on the fruit scales – hygiene at it’s best. After being given a price and told they would be ready the next day we were expected to pay and walk away. It was really cheap but we were slightly nervous we may never see our clothes again. The next day Dave went to collect them, pointed at the pile that was ours and was handed them back with no questions asked. Amazingly they were all freshly laundered and folded neatly, phew! 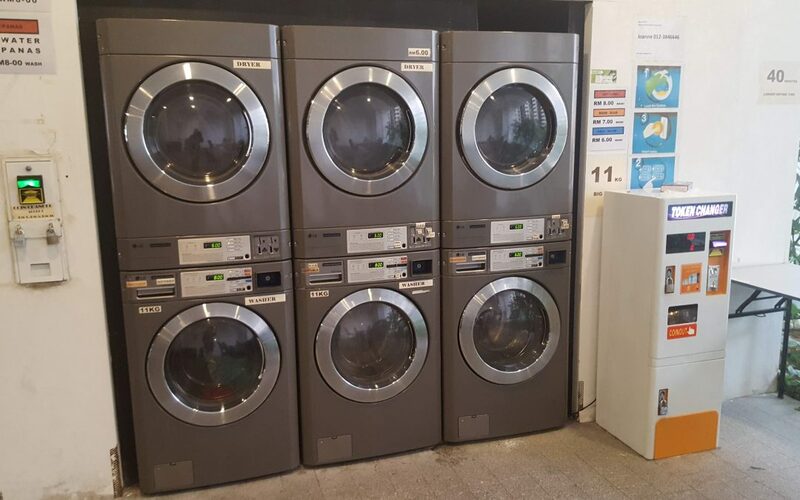 Penang was another handwashing location mainly for underwear as we’d kept on top of everything else in Koh Samui and when we arrived in Kuala Lumpur we had the luxury of a washing machine in our apartment and a rather warm walk-in wardrobe where we could dry it all. Onwards to Tasmania and we knew that most of the Big 4 holiday parks had laundries so we had planned to wash as we needed to and mostly this worked without incident. However, once we got to our apartment in Hobart and were ready to do our final wash before heading to New Zealand, things took a turn for the worse! The washing machine had decided to leave some washing powder sediment on a few of the clothes and Dave (who was doing a great job of keeping on top of washing whilst Sarah was working) decided to find a way to remove this from Sarah’s trousers, sadly this plan didn’t quite work and said trousers ended up with a very nice hole in them and had to end their days in Tasmania. As we write this we are now in New Zealand and have successfully washed twice including our motorhome towels without incident in campsite laundries. Hopefully, this will continue and washing on the road will be successful. Although I’m sure at some point we will need to wash our sheets as a month with the same ones may not be pleasant so there may be an update to this blog at some point. On a final note, we can confirm that it is possible to travel with just 5 pairs of pants each, however, we have also discovered that somehow the girls have 7 pairs – not sure where the extra came from! !